It’s very rare that I go to bed at a reasonable hour. But when I do, I maximize the power of 8 glorious hours of sleep by packing on a generous layer of Hollybeth Organics’ Eye Cream. This pillow-soft eye cream, made with just six ingredients, coats my eye area with a heap of moisture that lasts through the first sound of the alarm. When I wake up, I notice that the skin around my eyes feels oh-so-soft. I’m not as puffy, but that’s because of sleep. However, HollyBeth Organics Eye Cream’s rich, luxurious texture keeps that crepe-y texture from creeping in on mornings when you’ve overslept and have pillow lines across your face. Think of this as your cushion-y skin guard! It’s no wonder that I’m drawn to this eye cream when I need a little comforting. Jojoba oil has always been my favorite since I transitioned to green beauty in 2007, and that’s the first ingredient in this formula. 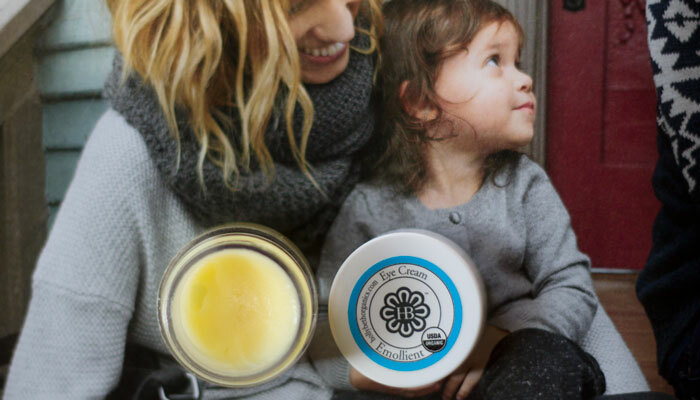 Beautiful, multipurpose sweet almond oil and exotic camellia round out the base while beeswax gives this formula its thick, rich texture. If you’re interested in paring down your beauty products, Hollybeth Organics’ Eye Cream also easily doubles as a lip balm. At $44.99 for a 1-ounce jar, it’s a smart multipurpose product that won’t break the bank and has all the organic ingredients you know and love. I’d repurchase it and recommend it to anyone looking for a simple, creamy, multipurpose treatment. How often do you use rich, dense eye creams? Do you switch up your eye treatments based on season or nightly habits? Have you tried anything from HollyBeth Organics? Tell me in the comments section!